It takes a lot of effort and time to create effective schemes that essentially conserve historic buildings. However, it appears that both scaffolding and temporary works have received little attention as approaches for handling historic buildings. These two are actually the means by which conservation schemes are effectively implemented. It is paramount to ensure that these two are handled with caution and focus on detail. Miscalculated steps or reckless actions could lead to the damage of historic fabric. The designing and erecting of scaffold and temporary works requires a basic process that is not entirely different from the one applied to other buildings that may have been affected. To prevent damage on historic fabric, there are key points that you need to note. First, you need to understand that in a historic building, any damage that occurs is usually permanent. This often leads to the loss of significant detail. For ordinary buildings, the damage can be fixed without leading to serious harm. There are independent tied scaffolds that are actually provided for maintenance works, painting and pointing among other activities. They comprise of two standard rows, which are the horizontal support and vertical support. The standard rows are connected by ledgers. They are referred to as independent scaffolds because they do not rely on the vertical support from the building. The word “tied” means that they are actually tied to a building for horizontal stability. Fragile historical buildings are not usually capable of providing the required horizontal restraint. Putlog scaffolds come in handy in the construction of brick walls. As such, they only have a single row that is erected just about 950mm from the wall face. Its boards are carried on horizontal elements referred to as putlogs. When applied in new construction, the leveled ends of putlogs are firmly fixed into the bed joints. At the completion of the project, they are usually withdrawn. This leaves you with holes that point up. In that case, putlog scaffolds are not recommendable for historic buildings. This is because the cutting of holes may lead to unnecessary damage. Temporary works are usually made necessary when there is a likelihood of a building to collapse. Apart from risk of a building collapsing, temporary works may also be applied in cases where certain crucial supporting elements need to be removed for alteration or renewal purposes. 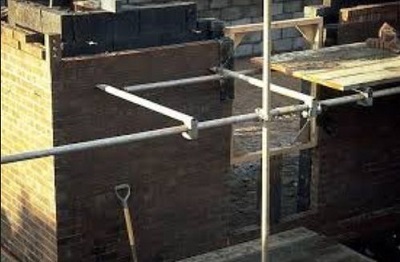 Loads that are carried by shoring can be actually great and as such, it is crucial to never underestimate the impact it may have on passersby if there is an ineffective design that could to damage. Therefore, you should ensure that the installation of shoring scaffold does not lead to any damage in historic buildings. In fact, the task of designing shoring should only be left for experienced structural engineers. You can definitely look for scaffold hire companies. Scaffolding design should not be left to the scaffold erector. Before determining the location of scaffold foundations, you need to do your homework well. This makes it possible to determine where applicable standards can and cannot work. It also helps in the determination of places where board decks will be positioned to ensure that a project is carried with minimal challenges and risks.